Anybody mod their Classic Vibe Tele? Discussion in 'Squier Tele Forum' started by aalcantara, Apr 7, 2015. Minimal or extensive, has anybody done anything to improve the personality of their Classic Vibe Tele? Esquired - new pots, wiring, stock bridge pickup. Easily my favorite guitar. Tons of guys, including me. This thread could go on for years! I have an all stock white blonde cv-50. It ain't broke so I ain't fixing it, ha ha! The tone and volume pots are a bit stiffer than most.. I read post on how someone 'oiled/lubed' theirs, and they were much less stiff.. I don't know, I haven't tried that yet. But the CV-50 is a perfect guitar to mod, if you want different specs. I love mine and it is also my number one. ... start with a 4-way switch -- all the CV versions have rwrp pickups so you gain a series setting and noise-cancelling. Also, that stock Alpha switch is destined to be replaced sooner or later! Greggorios, darren7 and bacongrease like this. Skip D, dougb415 and radiocaster like this. Only mod (if you can even call it a mod) that I've done to my 2008 VB CV50 Tele is to put a couple of ballpoint pen springs around the neck pickup screws. This enables the pickup to be raised beyond what the stock thin rubber pad under it will achieve, in order to balance output with the bridge pickup. Apart from that the guitar is just fine as it is, capable far beyond its price point and well up to the professional use to which I put it. Oh yes, I've also flatted down the gloss on the neck to a satin finish with a bit of Micromesh, but that hardly counts as a mod either. I bought a new Squier Classic Vibe Custom Telecaster. I had previously purchased the pickups, wiring harness, pots, and switch from a 2011 Road Worn Telecaster. The neck pickup is a Seymour Duncan '59, the bridge pickup is a Fender Tex-Mex. This guitar will never leave, it is killer for blues and jazz. GreatDaneRock and bacongrease like this. Bruxist and cdwillis like this. Got a CVC back in 2010 not coincidentally right after joining this board. Incredibly nice playing & sounding tele. I immediately swapped out the switch tip to an aged strat style tip and put an electrosocket/switchcraft jack in. After 2 months of playing a bunch the bridge pup died. I had a tex-mex pup out of my RW50 laying around so I traded that to my bro for a old overwound from his '95 telecaster special. Outstanding tone with that one. Maybe a couple of months later, even though I really, I mean really liked the neck pup, I "upgraded" it to a SD Antiquity II that was pretty sweet. Then I bought a CV50 BSB and ended up liking the maple neck on that one better so I swapped necks and sold both the loaded BSB body and the stock rosewood neck for $250 on eBay. Next mod was getting some Kluson Deluxes with the white machine heads. Loved them & they looked pretty cool on that guitar. Those tuners are rock solid. A little while later I realized that I actually liked the neck pup from my old LAT better than the Antiquity so out it came in favor of a SD Alnico II Pro. And then finally about 6 months ago, last mod (yeah, right!) was putting the neck (with relic'd tuners) from my old Joe Strummer Tele on there. Wow, one of the best rosewood necks fender makes on my fav (by now) partscaster. Oh yeah, did I mention I Esquire'd it along the way, too? heavily! I have a Thinline CV Tele, and have a new neck, new pick ups, changed the wiring for quality wire and pots/caps, and compensated saddles. But honestly the only "necessary" upgrades to me were the saddles and electronics (pick ups were decent though). It's just that I needed it fine tuned for my needs, and had an amazing deal on a custom made neck. Ben-Zion, Gordzilla, tho618 and 1 other person like this. Keystones and a 4 way, Squier Standard neck, bone nut, Electrosocket, and Warmoth guard. Ben-Zion, MadRocker, Roadsong66 and 1 other person like this. Keystones and a 4 way, Squier Standard neck, Bone nut, Warmoth guard. I'm digging that white pick guard!! Sure did, first thing was the pots and switch, CTS 250K, Orange Drop, treble bleed. The original neck warped a bit so I picked up a tinted version pretty cheap, probably because the nut wasn't quite right, so replaced that with a TUSQ. New Cavalier pickups (Fat Lion, Lioness), Fender bridge plate and steel Callaham comp saddles. It's my favorite and I play it the most of all my guitars. I love the pickups, they just sound fantastic! Changed the strings and removed the gloss from the back of the neck because mine was a little gummy. Relic'd the neck from there and sanded off the squire logo. i only did that because i wanted to show other guys how nice squires can be! Not one person guessed it was a squire lol. I plan on putting some new Twang king pickups in and i dont think there will be any way to improve it! - Put 2 Taiway switches to get In series and Out of phase sounds. - Installed a big Sanwa killswitch. - Sanded off the back of the neck. - Turn the glossy finish into a matte thing (not finished yet). - Installed two golden american std. string trees. - Fender CS Nocaster in the bridge position. - Lace Sensor Gold on the neck. - Custom made lexan pickguard. - Wiring and electronics: CTS pots, cloth and braided wire, CRL switch, orange drop cap, Switchcraft jack. - Fender HW1 bridge (heavier than the vintage). - Fender vintage brass saddles. Stratsandaks and ricardobilbio like this. 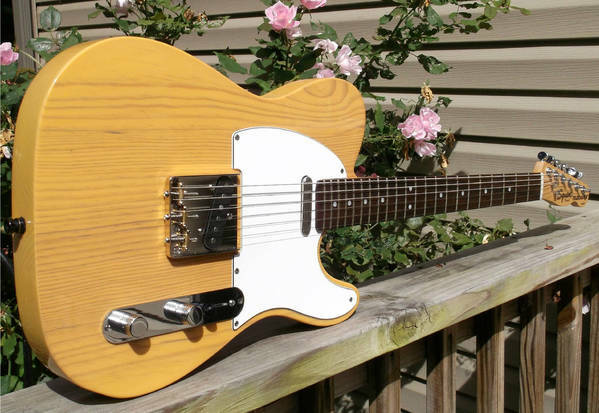 I have a CV Thinline... and I I love that neck, was it a drop in fit or did it take some work?